There's a last minute flight from Toronto (YYZ) to Liberia, Costa Rica (LIR) in Central America available for $342 roundtrip after taxes. It's through Sunquest Vacations / Thomas Cook but operated by Westjet. 3. Search for a flight from Toronto (YYZ) to Liberia, Costa Rica (LIR) from January 12 to January 19. Once it sells out, there will be an error message displayed instead of the verified price screen. UPDATE 1: Jan 19-26 now looks to have dropped to $363 roundtrip after taxes. UPDATE 2 - 01/10: Departing Jan 14 and returning Jan 21 just dropped to $112 roundtrip after taxes!! It initially shows as $342, but drops to $112 on the verified price page. UPDATE 3 = 01/11: Getting the error message on the Thomas Cook price verification page now, meaning the flight has sold out. Congrats to those that were able to book the craziest flight deal of the year. 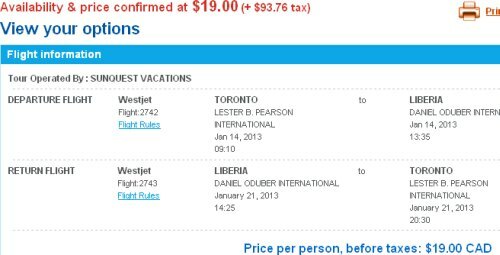 toronto, yyz, westjet, flight deals, liberia, costa rica, lir, central america and sunquest vacations. 4 Responses to "Last minute flight from Toronto to Costa Rica - $342 roundtrip after taxes"
Thanks a lot Chris !! !